Preparing for the future means investing in ourselves and our community. Quality education is at the heart of this investment as we work toward a community that’s learning and growing. With a skilled workforce and engaged community, Mecklenburg County will be ready for its future. "Education is one of the most important investments we can make in ourselves and in our community. Without it, hope for the future is difficult to fathom. 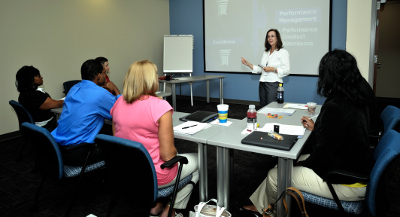 Mecklenburg County needs to plan how it’s going to keep the community learning and growing." Develop a common definition of career readiness, and coordinate the roles of various organizations working on career-readiness to develop common goals. List relevant education and training opportunities categorized by different demographics (i.e. youth; adult) and local as well as global work opportunities. Expand lifelong learning opportunities to professional and aging population. Evaluate curriculum, and encourage businesses to help mold the educational system to create workforce opportunities. Support Pre-K and K-12 out-of-school care and education curricula to expand capacity for schools to partner with families. Integrate soft skills training into public school curriculum. Raise the profile and use of career readiness certificates with employers and residents. Expose parents to different types of careers possible for their children. Establish a career pathways roundtable to continually adjust school curricula to meet employers’ current and future needs. Focus attention on high school preparedness and the transition to ninth-grade. Provide students with additional internship, apprenticeship, and mentoring work-based learning opportunities. Provide specific and coordinated job-training to residents in their 20s. Strengthen programing and support employers in hiring at-risk residents for a more inclusive workforce. Raise the status of post-secondary training with parents by communicating the importance and different types of post-secondary education. 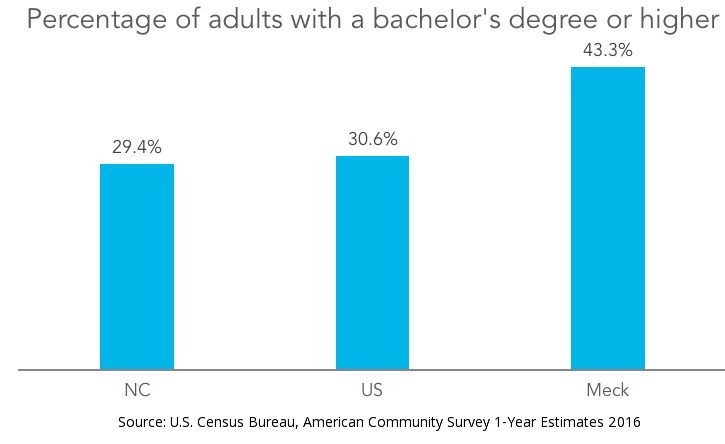 Residents of Mecklenburg County are more educated than the population of the country as a whole, with over 43% of adults (age 25 and older) holding a bachelor’s degree in 2016. This high level of educational attainment is fed by strong in-migration of educated workers from around the US and abroad. The local economy’s strength is strongly linked to the skill of its workforce. An increasing number of students educated by Charlotte-Mecklenburg Schools are graduating from high school, helping to prepare the future workforce and influence economic growth. 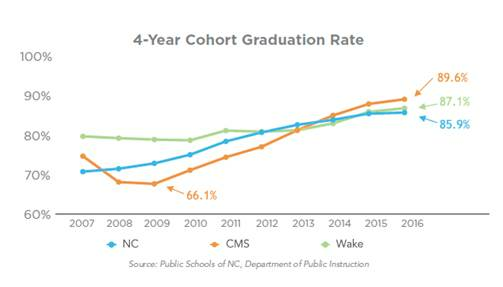 As seen in the graph below, (CMS) exceeded the state and Wake County’s (Raleigh) high school graduation rates in recent years. Character. Entertainment. Opportunity. Safe Neighborhoods.